We specialize in personal attention and detailed results. We're different from your "mega" sized fertilization companies because we know your lawn. our tecs will remember your lawn because we're focused on the nitty gritty details. We might suggest some added services to improve your lawn but we won't ram it down your check book. We also wont do services you never asked for or don't really need. You lawn should look great, but you don't have to pay for a bunch of stuff you don't need! 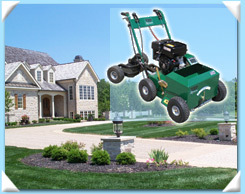 Aeration and seeding, See how we can do better than your curent fertilization service. 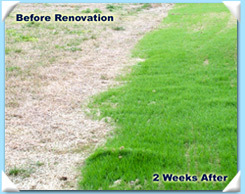 SLICE SEEDING (also referred to as slit seeding) is the best way to renovate, replace, or repair your lawn. Our top of the line seeder will make slices in your lawn 1” apart while planting seed. This system yields the best germination and overall success rates of any seeding process. Our pricing is the lowest in the industry at $85 per thousand Square Foot! We use only PREMIUM SEED when slit seeding and over seeding! 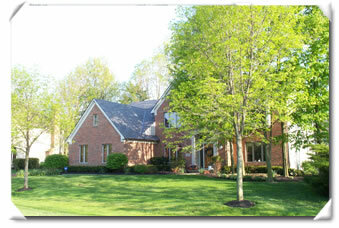 Our knowledgeable staff will select the right seed to match your existing lawn and the conditions it grows in.